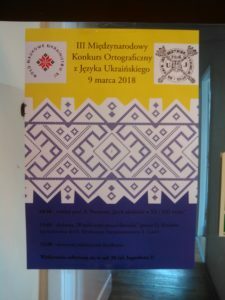 From 8 to 9 March 2018, the III International Ukrainian Orthography Competition was held at the Institute of East Slavonic Philology at Jagiellonian University in Krakow (Poland). Representatives from 14 educational institutions from Poland, Serbia, the Czech Republic, Russia, Bulgaria took part in this year’s contest, with representatives of Germany and Austria joining for the first time. This is especially significant, as 2017-2018 has been announced the Year of Ukrainian language in Germany and of German language in Ukraine. This important event contributes to the intensification of the study of the Ukrainian language, in particular at such higher educational institutions as the Humboldt University of Berlin and the European University Viadrina (Frankfurt/Oder). Sergei Antonovsky (Moscow State Institute of International Relations, MGIMO), won the first place. Anna Filipiak (Adam Mickiewicz University, Poznań) won the third place. Such spelling competition in the Ukrainian language has been conducted in Poland for the last 13 years, and it has been expanded to students from other European countries, where the Ukrainian is being spoken and studied. Dr Oksana Baranivska, Senior Lecturer at the Department of Ukrainian Studies (Institute of East Slavonic Philology, Jagiellonian University) is the organizer and the inspiration of this Contest from its early days. In addition to the main parts of the contest (test and dictation), the competition was accompanied by a variety of cultural events, such as visiting the Museum of Jagiellonian University, reading poetry of Taras Shevchenko on the birthday of the great Ukrainian poet in the legendary theater cabaret “Pod Baranami”, a tour of the city of Krakow, etc.